Free author resources at the Build Book Buzz website: http://www.buildbookbuzz.com. Today I will show you a highly instructive example of how to build an effective author website. It’s actually the website for a former publicist, so it’s no surprise that the website excels at attracting the target audience. We can learn a lot about how to attract our own traffic by studying the many cool features on this website. Also, there is an abundance of free content on this website, like how to prepare and distribute a press release to create book publicity. The website is called Build Book Buzz. This is the website that former publicist Sandra Beckwith uses to attract her target audience—authors who need help with book publicity (both traditionally published and indies). She no longer provides book publicity services to authors, but now helps many authors save thousands of $$ by teaching them how to do it themselves. I will describe various features of her website, showing how they help to attract her target audience. This will be instructive if you check these features out as I describe them. Try to think of ways that you might be able to utilize similar features to attract your target audience. Here is the link to her website: http://buildbookbuzz.com. Check it out. Tip #1: The website name is geared toward the content, not the author. You know what the content is about instantly. Tip #2: The homepage identifies the target audience and attracts their interest immediately. Notice how the website doesn’t mention who is offering this content (i.e. you don’t learn that it’s a former publicist’s website or who the former publicist is) until further down the page. Tip #3: Nothing is for sale on the homepage. The homepage is geared around free content relevant for the target audience. It doesn’t look like an advertisement for a book, it doesn’t look like a fan page or biographical record, and it doesn’t look like a blog. Valuable free content that will interest the target audience is what will attract your audience to your website. Sandra does have books and services that she sells, but none of these appear on her homepage. Think about this. Tip #4: Visual branding. Study the images. The images aren’t the same, but most follow a similar blue, yellow/gold, and white theme, and feature a picture (not always the same) of an open book. Making the images slightly different helps you see that it’s not the same image, so you don’t ignore it. Having them all uniformly styled helps with the visual branding, and shows you that you’re clearly on the same website. Notice that they follow the three-color rule. The cover images look 3D, which helps to make a good visual impression. The information in the booklets is clear from the keywords that stand out in the title. Tip #5: The homepage offers a free booklet. The content will interest the target audience. The offer appears first at the top to attract interest, and is repeated at the bottom so if you’re sold when you get there, you don’t have to scroll back up to the top. Tip #6: The free booklet offer is a clever way to build an audience for an email newsletter. This helps to populate an email newsletter database (note that you must provide an unsubscribe option). How do you get an audience for a newsletter? Offer a free booklet to sign up. How do you get your target audience in the email list? Make a booklet that has content relevant for your target audience. How do you get your audience to discover your booklet? As part of a content-rich website geared toward your target audience. The emails you receive will provide a sample of how to use an email newsletter effectively. Although your content will be much different, there is much to learn here. If you have a book that you’re trying to market, this content is relevant to you. Tip #8: The website is easy to read. There isn’t a busy, distracting background. There is effective use of color with the text. Tip #9: Free content. See the Tips page (each page can be found by clicking on the index at the top of the website). There are a variety of free PDF files of interest to the target audience. It’s a content-rich website, and much of it is free. This attracts the target audience. See the tips for writing a press release (book announcement). These are invaluable. A press release is critical for news publicity, and has a specific formula for its preparation. Also see the tips for writing a tip sheet. Like the press release, this is something you need to help create news for your book. The other tips on the Tips page are also worth exploring. Tip #11: There is a blog on this website, but it really functions primarily as an author website, and the blog is just one of many components; it’s definitely not a website that was built around a blog. The blog, like the rest of the website, is content rich and free. You can probably find a lot of valuable information here. Tip #12: Let’s jump ahead to the Press Room page. When you prepare the press release for the news about the publication of your book (if you haven’t already done so, you want to do this), you should add a Press Room page to your website. Study the two press release examples on this page. They show you how to structure and format a press release. When you study the tips for how to write a press release, you should also re-read these two examples. This page also shows you how to format a Press Room page. 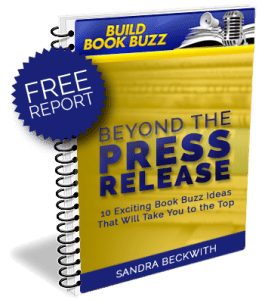 Tip #13: Check out Sandra Beckwith’s e-book, Get Your Book in the News. This is a detailed guide that spells out the formula for how to prepare a press release. I bought a copy, read it, and relied heavily upon it to write my press release for Read Tuesday. I recommend it. Tip #14: Finally, check out the other pages. There are a couple of books and services offered that aren’t free. Note that there is an abundance of free content, but also some paid content. The paid content is different from the free content. Also, the free content is complete. It’s not a free sample; it’s free content. There is ample free content, so you don’t feel disappointed or frustrated. If you don’t buy anything, you still feel that the website was highly useful. The free content is very good. This gives you the sense of trust that you need before moving onto the paid content. The taste of the free content makes you consider the paid content. Note that the paid content also has a satisfaction guarantee. I recommend that you take advantage of the free content on the Build Book Buzz website. There are a lot of valuable, yet free, resources there. I was not asked to write this post. I was not asked to promote the Build Book Buzz website or any of its goods or services. I discovered this website, found much of the material useful, and thought it would be handy to share it. I did contact Sandra Beckwith to let her know that I would be writing this post. Sandra Beckwith is a former national award-winning publicist who now teaches authors how to promote and publicize their books. Get free tips and subscribe to her complimentary Build Book Buzz e-zine at http://buildbookbuzz.com. Connect with her on Twitter, Google+, LinkedIn, and Facebook. Great advice from a guy who knows…almost everything. Thank you for sharing this, Ionia. 🙂 If you want to know everything, you just need to name your dog Everything. Q.E.D. Damn. I went with pickles. Thanks so much for featuring my site, Chris! That was soooo nice of you!